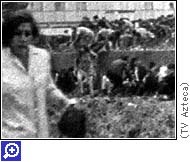 MEXICO CITY (CNN) -- Former Mexican President Luis Echeverria has broken three decades of near silence on the 1968 Tlatelolco Square massacre, casting doubt on the official version of the shooting that claimed the lives of as many as 300 student demonstrators. In a wide-ranging interview with congressional investigators and reporters Tuesday at his Mexico City mansion, Echeverria denied that he ordered government troops to fire on demonstrators. But he also discounted the official government explanation -- that the deadly gunfire came from other student radicals. "These kids were not provocateurs," he said. "The majority were the sons and daughters of workers, farmers and unemployed people." Echeverria, who as interior secretary at the time of the massacre was in charge of police and internal security, is pointing the finger at his boss back in 1968 -- then President Gustavo Diaz Ordaz. He said Diaz Ordaz, who died in 1979, is the only person who could have ordered government forces to fire on the demonstrators. "There was a hierarchy. The army is obligated to respond to only one man," Echeverria said. "My conscience is clear." 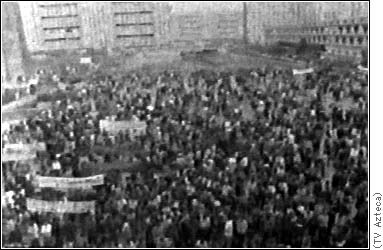 On October 2, 1968 -- on the eve of the 1968 Olympics in Mexico City -- gunfire erupted in Tlatelolco Square, where hundreds of student demonstrators, calling for greater democracy, had gathered to protest. Details of the massacre have been shrouded in secrecy ever since, including who fired on the demonstrators and even how many people died. The official government death toll of 30 has long been disputed by observers in the square that fateful day, who claim that at least 300 people died. Diaz Ordaz said the shots that killed the demonstrators came from other students firing machine guns from the roofs of buildings around the square. But critics of that official version say that a mix of uniformed soldiers, police and men in civilian clothing surrounded the demonstrators and opened fire. "What is certain is that those who fired on the crowd, those who carried out an encircling action to trap them, were military forces," said author and journalist Elena Poniatowska, who has interviewed dozens of survivors. Historian Lorenzo Meyer likens the killings to the 1989 massacre at China's Tiananmen Square: "A frantic response by bureaucrats who felt the (student) movement was threatening their grip on power." 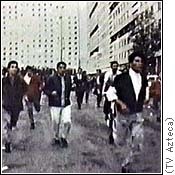 The killings helped spawn a series of guerrilla movements that disrupted Mexican society throughout the 1970s. In a speech last year, current President Ernesto Zedillo called the student movement and the events of 1968 "the watershed of the country's political life, when a real public outcry began for a more democratic country." 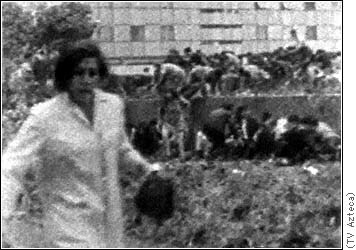 Earlier this year, after opposition lawmakers took control of the lower house of Mexico's legislature from the ruling Institutional Revolutionary Party, a new investigation was launched into the events at Tlatelolco Square. 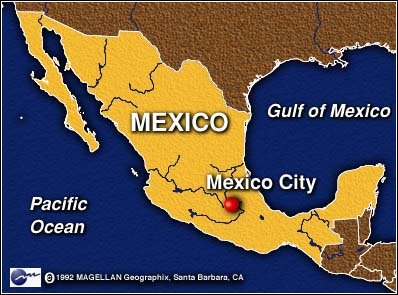 Echeverria, who at the time held the second most powerful post in Mexico, was widely believed to have ordered the killings. 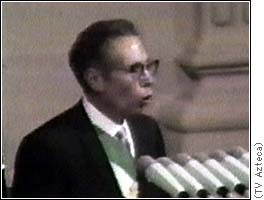 In 1970, he was selected as Diaz Ordaz's successor to the presidency, which was reviewed as his reward for cracking down on the student movement. During a government counterinsurgency campaign in the 1970s while Echeverria was president, as many 148 leftist activists disappeared. He left office in 1976, amid a deteriorating economy and allegations of corruption. Since then, the former president's comments about the massacre have been few and far between. In a 1978 magazine interview, he backed up the government's account of the incident -- and had not spoken publicly about it again until Tuesday. He invited congressional investigators to his home to talk about what happened -- but angered some of them by allowing reporters inside as well. He also extended an invitation to a group of about a dozen mothers protesting outside, whose children are among those who disappeared during the 1970s. At times rambling and incoherent, Echeverria, 76, talked for more than two hours, addressing issues from the massacre to what he sees as the inadequate economic policies of the current Mexican government. When asked how many people were killed in the massacre, Echeverria said, "I don't know. The numbers have varied." He declined to answer other specific questions. Some opposition lawmakers left in disgust, saying Echeverria had turned the fact-finding meeting into a political farce. Official records concerning the massacre, which could shed light on what happened, were sealed for 30 years, which means that will finally be available this upcoming October. But there may not be much in that official archive. Mexican presidents are allowed to take their official papers with them when they leave, and military officials maintain disclosure requirements don't apply to them.